Some of my favorite moments working at Chez Panisse took place after service, when the staff would come together for food and drink at the end of a busy night. On the eve of Christmas Eve in 2009, service concluded, and a few of the café cooks concocted the most delicious eggnog for a late night holiday toast to conclude family meal. That eggnog reaffirmed, in typical Chez Panisse fashion, that what is most simple and straightforward is often the most beautiful and delicious. It also established in my mind the two main requirements of good 'nog: it must be frothy and fluffy, and garnished with pomegranate seeds. Two nights later I hosted Christmas dinner, and concocted my own 'nog that was a surprising success. Even my mother had two glasses. While I now extensively chronicle all of my culinary endeavors, the Anne recipe binders were not yet in existence, and my eggnog recipe vanished into the abyss of Christmas past. Fast forward four years to 2013, sitting around the Christmas Eve table with many attendees of the first epic eggnog Christmas dinner plus the Man, memorializing the 'nog and its recipe's tragic disappearance, when my mother chimed in that she had found a copy! Needless to say, Christmas morning was spent at the grocery store buying all the necessary ingredients. The stockings could wait, but the 'nog could not. The one catch was that in 2009 dairy was still a staple in my diet, so in order to partake in the 'nog revival myself, I needed to make some alterations. Here is the revised version of the "Anne 'Nog" recipe (as it was titled on the scrap of paper my mother dug up). Evidently mom loved it because she had a glass or two, hence her famously tipsy Christmas. Good job, Mama. Again this year? Happy Holidays! Beat the egg yolks with a hand mixer until they lighten in color. Slowly add the agave nectar, beating until incorporated. Add the coconut milks and bourbon, and whisk until combined. Grate some nutmeg with a Microplane zester, and add it to the yolk mixture along with a pinch of cayenne pepper and ground cloves, to taste (about a generous pinch of each). Whisk to combine. Separately beat the egg whites until stiff peaks form. Whisk the whites into the yolk mixture. 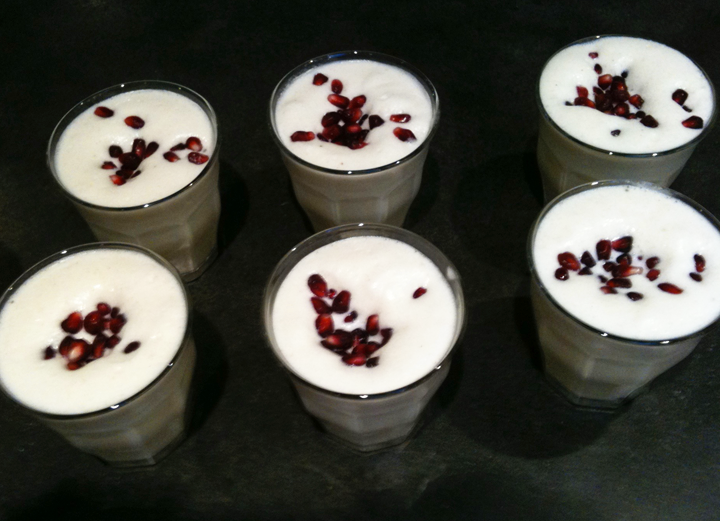 Scoop the eggnog into glasses (being sure to get good froth in each glass) and garnish with pomegranate seeds. Best served fresh. Refrigerate between helpings. I gave up drinking coffee after my father passed away. During the time he was sick with cancer and I was his caretaker, I existed solely on coffee with cream. At least a pot a day. All of my food energy was dedicated to finding something he would eat, and I lost track of eating myself. I was faced with the fact that, barring any scrambled-egg-induced miracle, my father wouldn't be around come fall, and that's enough to make anyone feel sick. And before little more than a month had passed, I had unknowingly lost 30 pounds. I don't recommend the "coffee cream diet" as a viable means of weight loss. Just to clear that up. After my father passed away I had a lot of work to do- emotionally as well as physically. My body was a skinny wreck, and replacing coffee with real food was a priority. So it got the boot. I know some of you are thinking "I thought she was allergic to cow's milk!" as well as a slew of other father and weight related thoughts. I told you this new blog is going to be more personal... Yes- I am allergic. But before my dad's cancer I could get away with eating small amounts of the things to which I am allergic. Or maybe I just ignored the side effects. But the stress and lack of eating angered my allergies, and they emerged out the other side a lot bigger and badder than they had been five months previous. Not to be ignored. But back to the coffee. Let's be honest, the process of grieving and healing during the winter is a whole lot easier with a deliciously frothy warm beverage in your hand. Since I was off coffee, off cream, and allergic to soy milk as well, I needed to find a suitable and equally comforting drink to enjoy. As much as I love mint and green teas, they can fall flat in comparison to a hot milky beverage on a cold rainy day. Sometimes I crave the satisfying creaminess that hot water with a tea bag lacks. Almond and rice milks are becoming more common in some areas, and a Chai latte using one of these milks at a coffee shop can be a real treat. So at home I developed the habit of making a tea latté that is slightly less sweet but equally as delicious on a day when you need a comforting extra boost. If you have an espresso machine with a milk steamer, feel free to use that to heat and froth the milk, and steep your teabag in the milk after it is hot. Otherwise, I use a Rösle Milk Frother that my wonderful Uncle Walter gave me a few years ago. I now drink coffee again, and am happy to live between Ketchum and Lakeville, both places that embrace the non-soy non-dairy milk craze with open arms. The people here also embrace friendliness, so sometimes the smiling face behind the counter while ordering my standard-fare almond milk latté is practically comforting enough. I also eat food again. Plenty of it. Quite happily. And have a pile of discarded skinny jeans to prove it. Getting healthy again was part of the inspiration for Anne food., so this one's close to my heart. Heat your milk in a sauce pan (or in a mug in the microwave) until hot (about 2 minutes in the microwave if your milk is straight out of the fridge). Pour the hot milk into a mug if it's not there already, add the tea bag and let steep according to tea bag specifications. Remove the tea bag, and add flavorings and sweetener if desired. Submerge the tip of the frother just under the surface of the milk to create a vortex and incorporate air into the milk. Spontaneity is the best. I'm a planner, so being spontaneous sometimes comes slightly less naturally to me (as the Man can attest to) but I wholeheartedly admit that some of the best things in life occur quite naturally, and often last minute. We had just gotten back from Ketchum, and in an effort to counteract the hermit-like tendencies that the Man and I have in the remote forest of northwestern Connecticut, I decided we needed to have some friends over for cocktails. Right then! We didn't have a whole lot laying around since we had just been out of town, but there was a Meyer lemon in the freezer that I had tossed in there on our way out the door two weeks before, as well as a bag of frozen cranberries from Thanksgiving. The truth is out- I hoard leftover ingredients in my freezer! Seriously, freeze what you can't use, and it will likely come in handy later (a chopped onion and fennel tops for some soup, 1/2 orange for a smoothie...). And when it is time to cook, be inspired by what you do have and just run with it. I never would have concocted this drink had I not been limited by ingredients, but it was fantastic! I'm often so much more creative when there are stipulations attached. For those of you unfamiliar with Cynar, it's a liqueur made from a variety of herbs and plants, primarily the artichoke featured prominently on its label. Cynar is classified as an Italian Amano, which is simply a bitter herbal liqueur commonly drunk after dinner as a digestif. If I had to compare Cynar to something, I suppose I would say Campari. The flavors are different, but it fits the same bitter profile. In a small sauce pan over low to medium heat combine the lemon, cranberries and maple syrup with 1/4 cup of water. Let simmer until the cranberries have burst and the mixture has thickened. Taste for sweetness, and add a splash more maple if necessary. Let cool. For each cocktail combine a large spoonful of your syrupy fruit mixture, 1 ounce gin, a splash of Cynar and 2 ounces sparkling water in a rocks glass. Stir, and taste. Add a few ice cubes and serve. 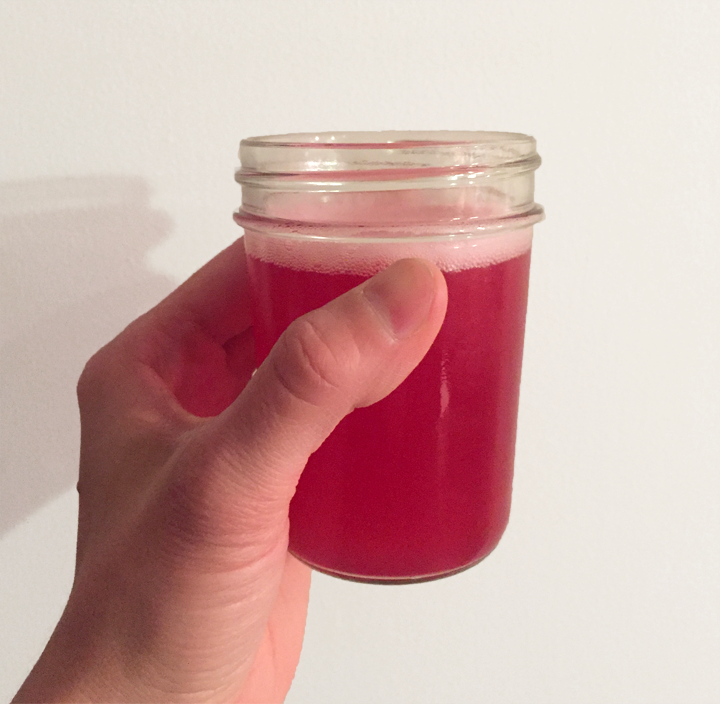 This one's for Katherine, and those of you who have been requesting more juice recipes! As a follow-up to my Autumn (Green) Juice, here's a juice whose color reflects its content. I generally prefer to eat my fruits instead of juicing them, but I do add a small apple to this bad boy. Lacking the sweetness of root vegetables, this juice is rather like drinking the cabbage patch without it. Push the ingredients into the tube of an electric juicer. As the leaves on the trees change color, apparently so does my green juice. I am not big into the juice cleanse craze, and think that maintaining a lifestyle of eating whole unprocessed foods on a daily basis is a much preferable way to keep your body running smoothly. That being said, pumping the body full of nutrients with a freshly pressed vegetable-based juice to supplement an already healthful diet doesn't seem to have any downsides! I steer clear of most sugar, so I warn that this recipe might be better suited to the advanced vegetable juice drinker! Most days I find that the beets add plenty of sweetness, but when I'm craving something sweeter I'll add an apple to the mix. Fruits are full of important vitamins, but they're also full of sugar, and the fiber in a whole piece of fruit is important in regulating blood sugar levels. So when I do add fruit to my juices, moderation is key or else I'm bouncing off the walls and crashing down shortly thereafter.